Discover a complete system of magical work based on the myths of Arthur and his knights. 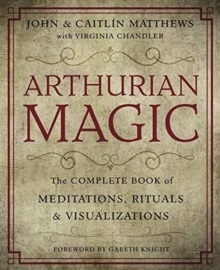 With meditations, rituals, visualizations, and pioneering shamanic techniques, Arthurian Magic leads you on a profound soul journey designed to raise consciousness and offer deep levels of wisdom. From Dr. John Dee to the Order of the Golden Dawn to the more recent fascination with the mysteries of the Grail and the Templars, dozens of magical groups and countless individuals have turned to the myths of Arthur and his knights for initiation, inspiration, and instruction. This book is a guide for beginners and more experienced practitioners to incorporate the deep spiritual power of the Grail stories into their lives. We hope that many of you will be able to join us to launch this important volume with John & Caitlin Matthews. Please RSVP to us here at the Shop so that we know to expect you. If you are unable to attend but would like a copy of the book reserved and inscribed for you, please contact us and we can organise that for you too.